“I don’t let labels limit the pure joy of exploring my options” explains curator Kimberly Drew. In only six years Kimberly Drew’s blog, Black Contemporary Art, has become widely recognised for the collection of work it holds by—and about—people of African descent. Following an internship at The Studio Museum in Harlem, she felt the urge to present the names that she had learnt there: but without the agenda of a new canon, or the correction of art history. Kimberly, who has been running The Metropolitan Museum of Art’s social media accounts for nearly two years now, was invited as a jury member of this year’s Berlinale Shorts program. We spoke to Kimberly about the development of her blog, her learnings in social media and how the international recognition of her work has heightened her imposter syndrome. For the week of Berlinale Kimberly will take over Freunde von Freunden’s Instagram account, posting about her experiences at the film festival. 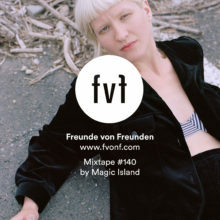 Follow along @fvonf. Your blog ‘Black Contemporary Art’ was founded in 2011, since then it has become a reference point for everyone tired of ‘white’ art history. Was it your aim to create a new or alternative canon? I started Black Contemporary Art with an interest in recording the names of artists that I’d learned during a summer spent at The Studio Museum in Harlem. My introduction to art and art history was never centered on whiteness, so I always push back when I’m asked about a seeming “otherness” that I may encounter in my work. My aim in 2011 and my aim today is to center my work on the images, narratives, and spaces that I think are valuable. To paraphrase Kerry James Marshall, I view my work as an expansion of the canon and not a critique of it. There are many labels for who you are and what you do: people describe you as a tastemaker, you describe yourself as a ‘quintessential millennial’, are there any labels that you absolutely reject? Oh, not really. I live a resplendent life. I don’t let labels limit the pure joy of exploring my options. Doreen St. Félix says your Tumblr and Instagram ‘function as real spaces for viewers to begin a conversation with contemporary art.’ Is there a difference between URL and IRL in your life, and does this impact your understanding of social media? I look forward to how scholars of the future look back at our URL moves today. I love working in social, but I’m also really committed to stillness in my personal life. I enjoy the dichotomy of the loud and quiet when engaging online. I love the smell of paint, I love finding a new artist on Instagram, and I don’t necessarily see those two gestures as mutually exclusive. Simply, from my desk: social media is a medium for connection and observation. What are cultural institutions and media outlets missing out on if they don’t use social media? Do you think Facebook and Instagram have become essential in order to be seen in the cultural landscape? Social media is hard work. I think that any institution with the bandwidth to support a full-time social media manager should absolutely invest time and energy into engaging with their respective communities online. Personally, I believe very deeply in the power of social media as a tool, but as with any tool, an unskilled practitioner can do more harm than good. What makes a successful Instagram account? I think that social media success is relative. I love to see people get weird, truly. Irreverence is king in my eyes. What have you learned from your followers? My followers teach me new things on a daily basis. It’s odd to have fans, but being as visible as I am reminds me that I can have a huge impact on the world around me and I take that very seriously. You receive a lot of invitations for panels and talks, now you’re a jury member at Berlinale—what are your expectations? I am beyond honored to participate in this year’s Berlinale, but I am a bit intimidated. I love to binge watch documentaries about cults, weight loss, and obscure celebrities… My imposter syndrome is at an all time high and I don’t know what to expect, but I know it’ll be fabulous. Thank you Kimberly, for taking the time to chat with us—we know you’re busy working at The Metropolitan Museum of Art in New York, and running @museummammy and Black Contemporary Art! If you’re curious about this year’s Berlinale Shorts program have a look here and to browse the full schedule of Berlin’s annual film festival go here.